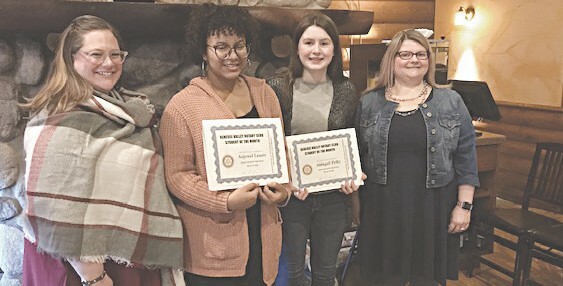 FLINT TOWNSHIP — Abbigail Pelky and Anjewel Lenoir are the Genesee Valley Rotary Club March Students of the Month for Carman- Ainsworth High School. Pelky, a sophomore, was nominated by Sarah Ricketts. She plays varsity softball and serves on Student Council. Pelky currently maintains a 3.9 grade point average with three accelerated classes. She plans to attend Northwestern University or Specs Howard to earn a degree in communications and journalism. Lenoir, a senior, was nominated by Delynne Miller. 2017, Hope College Honors Band, Symphony Band and Chorale just recently received division 1 ratings at festival,” Miller wrote. Lenoir plans to attend Siena Heights University to major in theatre and music. “Anjewel is a true artist,” Miller said. “She has been involved in every facet of the arts at (Carman-Ainsworth). Not only did she have three years of art class, four years of band, (and one and a half) years of choir, (but) she had also participated in more than seven theatre productions. “She is very dedicated to our organization and does whatever it takes to make our productions successful.” — L.R.